London underground billboards typically display information updates for passengers. 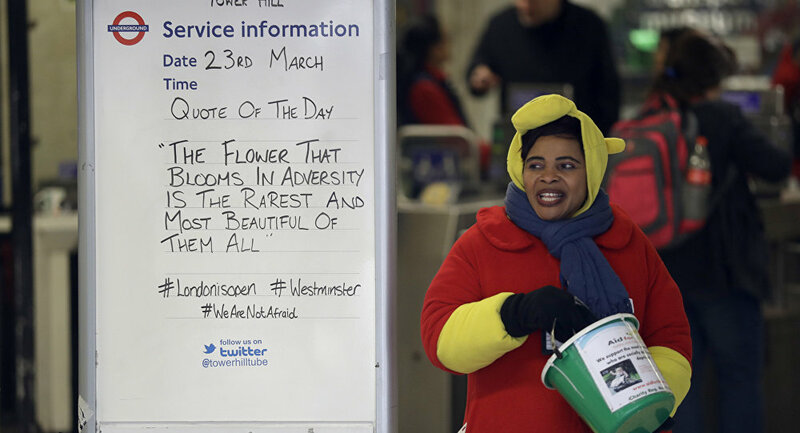 However after the attack that took away lives of several people and injured dozens more — London tube signs communicated a different type of message. At one London station a poem by Russell Sivey reads: "We Are Infinite One together holding true Unity so embraced." #WeAreNotAfraid Хотите узнать что думают лондонцы сегодня? Читайте стихи дня в станциях лондонского метро. Понятнее будет. At Tower Hill tube station, one message mentioned the power of living in adverse circumstances and how this can yield much fruit. Tooting Bec station told the world "United we stand and divided we fall." A message of togetherness, power and resilience. ​Oval Station in south London proclaimed that the city of London would not be afraid but would stand tall. When you are at your weakest, this is when you are strong. One London underground station displayed a message from Helen Keller, an American author, political activist, and lecturer, who was the first deaf-blind person to earn a Bachelor of Arts degree. It stated that despite the worlds sufferings, it was also a place where many had overcome and endured the greatest of hardships. The defiant reaction of the London underground bears significance, since it was only 12 years ago that three tube stations were targeted by terrorists in July 2005 bombings.